Residents of Tule Lake Block 42, who refused to sign the “loyalty questionnaire” and were collectively arrested and threatened at gunpoint by Army personnel. Photo courtesy of Mamoru “Mori” and James Tanimoto. On Saturday, February 10, JANM will host a screening of Resistance at Tule Lake, a new documentary from director/producer Konrad Aderer that tells the long-suppressed story of 12,000 Japanese Americans who dared to resist the US government’s program of mass incarceration during World War II. Branded as “disloyals” and re-imprisoned at Tule Lake Segregation Center, they continued to protest in the face of militarized violence, and thousands renounced their US citizenship. 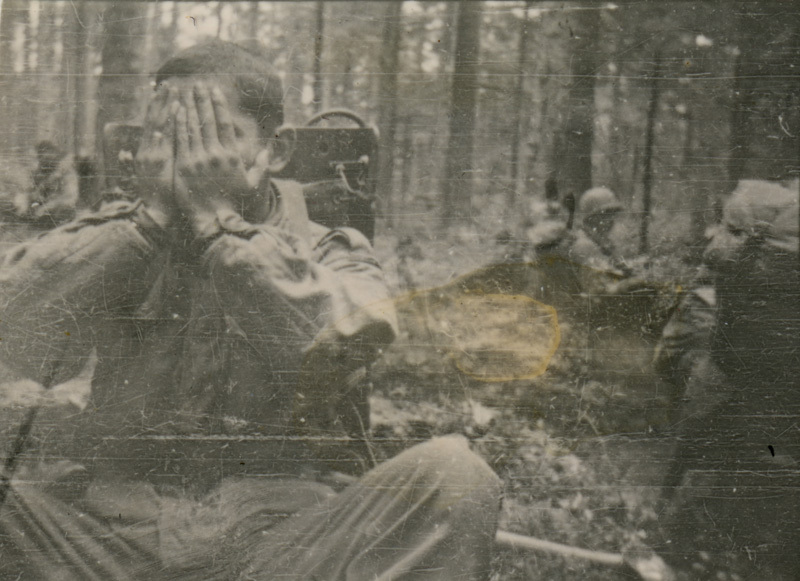 Giving voice to experiences that have been marginalized for over 70 years, the film challenges the nationalist, one-sided ideal of wartime “loyalty.” A panel discussion with the filmmakers will follow the screening. Tule Lake was one of ten American concentration camps that were hastily built to house the 120,000 persons of Japanese descent who were forcibly removed from their West Coast homes following Japan’s bombing of Pearl Harbor. Located in Modoc County, California, Tule Lake was the most conflict-ridden of the ten camps. In its first year of operation, it was beset by labor unrest, including strikes over a lack of promised goods and salaries and a mess hall workers’ protest. Then, in 1943, it was designated as Tule Lake Segregation Center and essentially became a prison camp for those perceived as “disloyal” to the United States. Hiroshi Shimizu, who is interviewed in the film, and his father, Iwao Shimizu, stand in Tule Lake Segregation Center, two days before being shipped to Crystal City, Texas, along with some 400 others who had renounced their citizenship. Photo taken on March 18, 1946, by Fusako Shimizu (mother). Courtesy of Hiroshi Shimizu. Tule Lake was chosen to be a segregation center partially because of its size and capacity, but also because the infamous “loyalty questionnaire”—an awkwardly worded document circulated by the US Army in all 10 camps in an attempt to determine who among the prisoners were patriotic citizens and who were not—was mishandled by authorities at the camp, leading to more unrest, turmoil among the inmates, acts of civil disobedience, and the largest number of presumed “disloyals” of any of the camps. Tule Lake Segregation Center soon became a maximum-security prison as “disloyals” from other camps were relocated there. The “disloyals” lived alongside original Tule Lake inmates who had answered the questionnaire with “loyalty,” but did not want to be displaced a second time. Home to a deeply divided and disaffected population and constantly beset with strife, the center was for a time ruled by martial law. The emotional fallout from living under such hostile conditions led some inmates to become disillusioned with America and to plan for a return to Japan after the war. Japanese American members of a pro-Japan group known as the Hoshi Dan honoring brethren who were being purged from Tule Lake and sent to Santa Fe concentration camp before being deported to Japan. Photo courtesy of the Tule Lake Committee. Come to our screening on February 10 to learn more about this dramatic episode in Japanese American history. JANM members may also attend an exclusive pre-event reception with filmmaker Konrad Aderer. Visit our website for more information and to RSVP. A panel from Chapter 3 of Bombshells United. Courtesy of DC Entertainment. Many news items come across the desk of the editor here at the First and Central blog. As busy as we’ve been over the last few months with the opening of JANM’s major new exhibition, Transpacific Borderlands: The Art of Japanese Diaspora in Lima, Los Angeles, Mexico City, and São Paulo, and various other developments, we haven’t had the chance to share as many of these as we’d like. Following, therefore, is a roundup of notable news items from the last few months. If you missed any of them, here’s your chance to catch up! Our own neighborhood of Little Tokyo was named one of 14 California Cultural Districts by the California Arts Council. A new initiative in its first year of operation, the Cultural District designation is designed to “grow and sustain authentic grassroots arts and cultural opportunities, increas[e] the visibility of local artists and community participation in local arts and culture, and promot[e] socioeconomic and ethnic diversity.” The districts are also intended to play a conscious role in tackling issues of artist displacement. A Cultural District is defined as a “well-defined geographic area with a high concentration of cultural resources and activities.” The designation comes with benefits, such as technical assistance, peer-to-peer exchanges, and access to branding materials and promotional strategy. Per state legislation, each of the districts will hold the designation for five years. We couldn’t be prouder of our district, which joins other vibrant cultural centers throughout California such as the Eureka Cultural Arts District and Balboa Park in San Diego. To see the complete list of 14 districts, click here. To read more about the initiative, click here. Wonder Woman is looming large in popular entertainment these days. The blockbuster action movie starring Gal Gadot was a huge hit earlier this year, and a sequel is in the works. A smaller film called Professor Marston and the Wonder Women, which explores the origins of the classic comic book character, was just released last month. The staff at JANM was thrilled, therefore, to learn that a new digital comic book has come out that imagines Wonder Woman fighting, and even helping to prevent, the mass incarceration of Japanese Americans during World War II. The series, titled Bombshells United, is written by Marguerite Bennett and illustrated by Marguerite Sauvage. Bennett decided to write the story after noticing that her cousins’ American history textbooks failed to mention the incarceration. Angered by the erasure, she set about doing her research, reading books like Farewell to Manzanar and No-No Boy, and paying visits to JANM (!) and the Manzanar National Historic Site. The resulting story focuses on a group of ordinary Japanese American girls who hatch a plan to halt one of the trains going to camp. Bennett chooses to make them the heroes of the story, with some help from Wonder Woman. Although the story is a fantasy, many of the details are historically accurate. Bennett plans to continue exploring a variety of WWII and postwar stories in this series, even looking at intergenerational struggles between the Issei and Nisei. Read an interview with Marguerite Bennett here. Purchase the comic books here. Everyone’s favorite JA mystery writer is at it again. Our Discover Nikkei project, which has hosted several exclusive serials by Naomi Hirahara, is especially thrilled this time to serve as the publisher of Trouble on Temple Street, the third installment in the Ellie Rush detective series. This installment, which follows two published book installments, will be published as an online serial, with new chapters coming out monthly. Ellie, an LAPD bicycle cop who has been on the force for two years, finds herself in the middle of a Little Tokyo murder case that may potentially involve the people she loves most: her family. Will she be able to connect the dots before the killer harms her aunt, who is deputy chief of the LAPD? Where will Ellie’s allegiance fall—to the truth, or to family loyalty? The serial launched on September 4 and will continue through next August. Read the first two chapters now! Podcast logo by Kelsea Bauer. The design combines a bonsai tree with the scales of justice. The following guest blog post, announcing the launch of a new podcast exploring the World War II incarceration of Japanese Americans, is contributed by Eric Muller, a law professor and longtime friend of the museum. After the election of Donald Trump, many people were asking themselves: “How can I help counter what lies ahead?” I decided to create a podcast called Scapegoat Cities, which is launching today. The idea is simple. Over the course of two decades of deep research in the National Archives for my books and articles, I’ve gathered many touching but unknown stories of the forced removal and imprisonment of Japanese Americans during World War II—stories that put a human face on the gross miscarriage of justice. Scapegoat Cities lets me tell a handful of those stories in an accessible and compelling way. I believe that if we want to ensure that something never happens again, we need to first ensure that we really know what it was that actually happened. That’s what this podcast is for: to help listeners know in detail and also feel how Japanese Americans experienced unwarranted confinement by the US government. My hope is that this will contribute in some small way to resisting the dangerous religious and ethnic profiling that the policies of the Trump administration threaten to enact. It will remind people of the real human costs of these seemingly abstract policies. The first two episodes, available now, give a good idea of what the podcast will do. “The Desert Was His Home” tells the story of the disappearance and death of Otomatsu Wada, an elderly Issei, from the Gila River concentration camp in Arizona. In “The Irrepressible Moe Yonemura,” an extraordinary young man defies all odds and becomes one of the most popular and respected members of his class at UCLA. He brings the same indomitable spirit to his time at the Heart Mountain camp—and then he volunteers for wartime service as part of the renowned 442nd Regimental Combat Team. Both of these stories are based on real events that took place at those two camps. Each of the stories, in its own touching way, reveals something important about the nature and impact of confinement. It’s surprising how much information survives that helps me tell these stories. I learned the story of the disappearance of the Issei gentleman from the records left behind by Gila River’s “Project Attorney,” the white government lawyer who both helped run the camp and who served as a legal adviser for inmates. The story was also extensively covered in the camp’s newspaper and in Arizona newspapers. I first learned about Moe Yonemura from the pages of the Heart Mountain Sentinel, the camp’s newspaper, and then discovered the UCLA campus newspaper and yearbooks and the narrative records of his battalion’s service in Italy online. There are lots of ways to listen to the podcast. The easiest is to subscribe to the podcast on iTunes or wherever else you like to find your podcasts. You can also go to the podcast’s website, which has each episode available for download along with additional background information, including photographs and suggestions for further reading. I hope people enjoy the podcast, and that those who do will leave a review on iTunes and tell their friends! Eric Muller is a law professor at the University of North Carolina at Chapel Hill. The son of a Jewish refugee from Nazi Germany, Muller has for two decades focused his research and scholarship almost exclusively on the wartime removal and imprisonment of Japanese Americans. He’s published two monographs and a third edited volume as well as many academic articles. He’s also proud to have led the creation of the main historical exhibit at the site of the Heart Mountain concentration camp in Wyoming, which won museum awards. 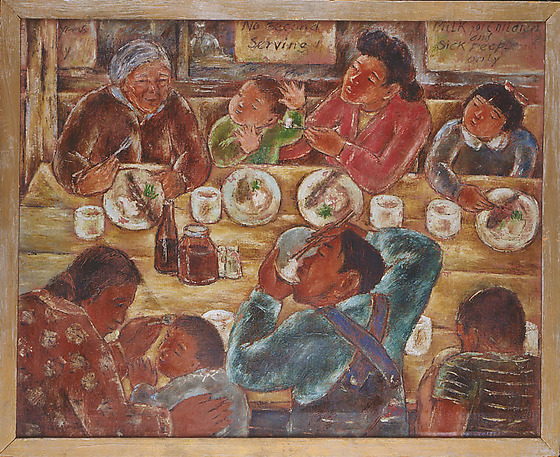 Henry Sugimoto, Our Mess Hall (1942), oil on canvas. Japanese American National Museum, Gift of Madeleine Sugimoto and Naomi Tagawa. After a bustling final weekend, Hello! Exploring the Supercute World of Hello Kitty has come to an end. JANM is now in the process of de-installing that show in preparation for the next two exhibitions on our schedule—Sugar/Islands: Finding Okinawa in Hawai’i—The Art of Laura Kina and Emily Hanako Momohara, opening July 11, and Before They Were Heroes: Sus Ito’s World War II Images, opening July 14. 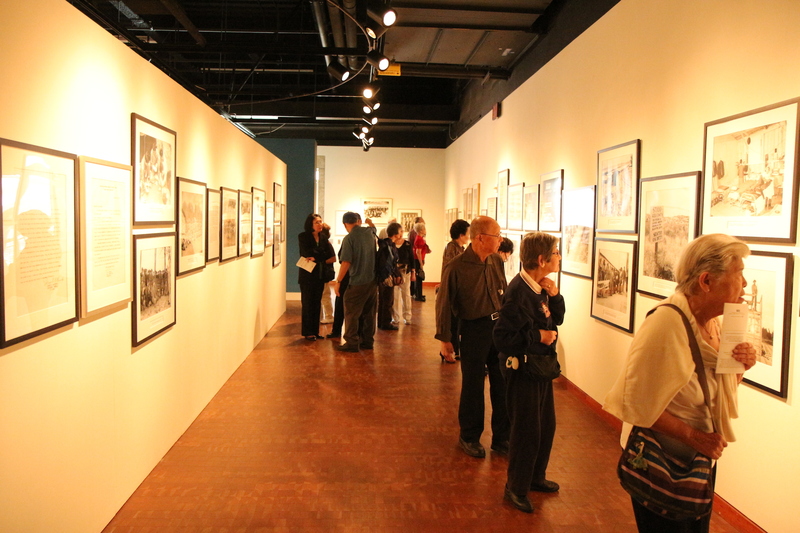 Common Ground: The Heart of Community, our core exhibition telling the Japanese American story, remains on view during this time. And if you happen to be in the museum on a Tuesday, Thursday (afternoon only), Saturday, or Sunday, you can also see a special temporary display in the Hirasaki National Resource Center. Building on the theme of “Life in Camp,” the display focuses on mess halls and food services in the concentration camps where 120,000 Japanese Americans were incarcerated during World War II. The painting captures the busy, crowded feel of a mess hall, while reminding viewers that strict rations were in effect. This fact is reinforced by artifacts installed in a nearby display case, which include facsimiles of actual daily menus distributed in the camps, along with memos reducing rice allocations in response to serious shortages. Also included are a bowl and utensils salvaged from various camps. In addition to the Sugimoto painting, the exhibit features a 1944 still life by Sadayuki Uno and a photograph of Japanese American farm workers at Manzanar camp, taken by Ansel Adams in 1942. Taken together, these artworks and artifacts offer an authentic look at the distribution and consumption of food in the WWII camps. On November 10, 2013, JANM held a Members Preview Reception for the exhibition, Go For Broke: Japanese American Soldiers Fighting on Two Fronts. The exhibition chronicles the history of Japanese American Nisei soldiers from the 100th Infantry Battalion, 442nd Regimental Combat Team, and Military Intelligence Service who served during World War II to prove their loyalty to the nation that had disowned them. 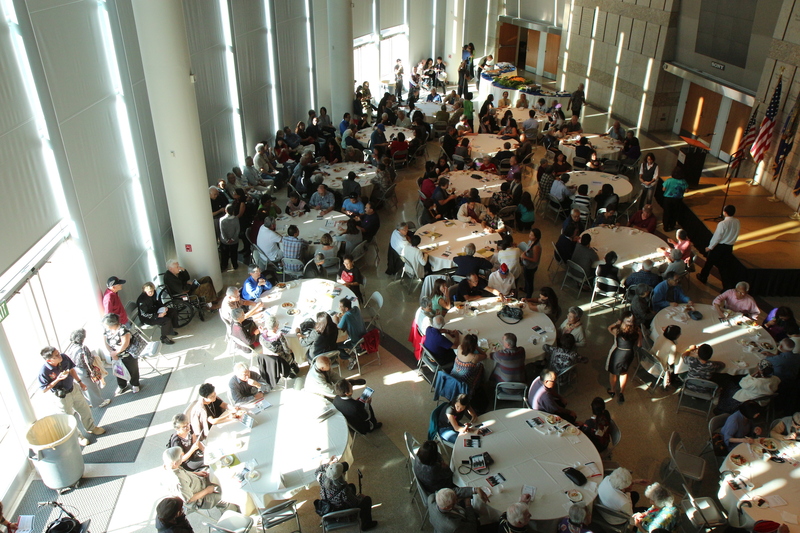 The Aratani Central Hall was packed for the reception and program with enthusiastic members and special guests. This preview included an informal gallery walkthrough given by curator, Eric Saul. The program started with America the Beautiful performed by Keiko Kawashima; a welcome by Helen H. Ota, External Relations Officer at JANM; and a special keynote by Eric Saul. It was a very intimate exhibition preview—it allowed guests to reflect on history, and to appreciate the efforts of Japanese American Nisei veterans before, during and even after World War II. Check out these photos from the member’s preview! Curator Eric Saul leads members through an informal gallery walkthrough, sharing insight on each photograph. Keiko Kawashima, a professional singer, actress, and dancer, sings America the Beautiful. Helen H. Ota, External Relations Officer at JANM welcomes members to the preview. Curator Eric Saul is the keynote speaker at the Member’s Preview for Go For Broke. The Aratani Central Hall is filled with members and special guests. Cynthia Villasenor, Vice President of External Relations at JANM, and Curator Eric Saul exchange a few words in the lobby. The gallery is filled with members, eager to view the extensive exhibition. The exhibition is supplemented by artifacts from the Museum’s permanent collection. Two members get a closer look at a photograph. Photo Credits: Tsuneo Takasugi, Richard Murakami, and Richard Watanabe. 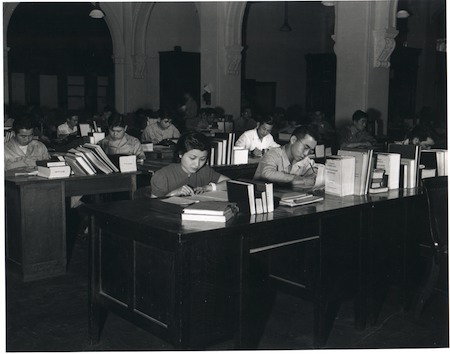 Nisei civilians and soldiers worked in the translation and scanning sections, responsible for the translation of all Japanese documents which was vital to the success of the occupation. Photo: National Archives. On Saturday, December 7th at 2pm author, professor, and M.I.S. veteran Edwin Nakasone will moderate a discussion with fellow veterans Bruce Kaji and Hitoshi Sameshima about their roles in the rebuilding of Japan after the end of World War II. The M.I.S., or the Military Intelligence Service, was a United States military unit mostly comprised of Japanese American Nisei who provided translation, interpretation, and interrogation services in the Pacific during World War II. This program is presented by JANM and the Go For Broke National Education Center. 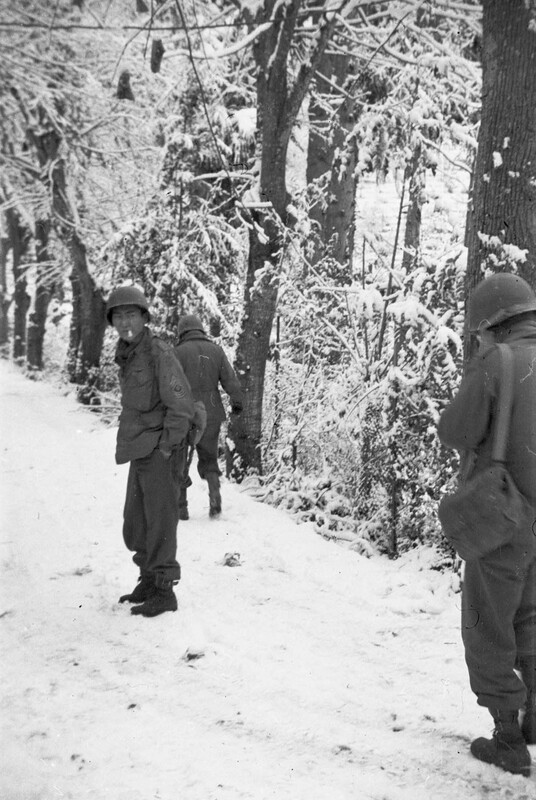 It is presented in conjunction with the exhibition Go For Broke: Japanese American Soldiers Fighting on Two Fronts (on view through March 2, 2014). Don’t miss this FREE and exciting opportunity to learn more about the M.I.S. from the veterans themselves! Edwin “Bud” Nakasone (left) will moderate the discussion. MIS veteran and JANM docent, Hitoshi Sameshima at JANM’s 2013 Gala Dinner. Bruce Kaji, JANM founding president & MIS veteran, will take part in this special program.